Efraín comes from Jujuy, a province in Argentina’s remote northwest region, where he lives with his mother and aunts. 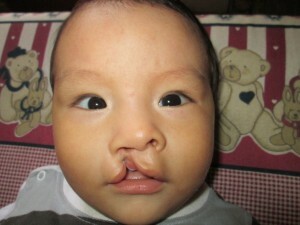 His mother is a young, high school student who had no prior knowledge about cleft lip and palate and could not afford private care for her son. Thankfully, she stumbled across our partners, Fundación GAVINA’s Facebook page and was relieved to learn that free treatment was available for her son’s condition. She then made the journey to the Tucumán province (where GAVINA is located) for her son’s treatment. At GAVINA, eight-month-old Efraín captivated the staff with his active, curious and playful manner. However, Efraín’s mother was very worried about her son. She had a lot of questions to ask, and was very uncertain about the treatment process. At GAVINA, all of her questions were answered, and soon after, Efraín received his first cleft lip surgery. Transforming Faces has been working in Argentina for more than 15 years. Our newest partner, Fundación GAVINA’s comprehensive cleft care services includes surgery, speech therapy, dental care, nutrition support and counselling for family members.